Binge eating and over-dieting are often two sides of the same coin (Tweet this). If you’re struggling with a compulsive eating disorder, you probably dieted for at least two years or/and fasted a few times. After a couple of years, dieting changes your relationship with food forever especially if you were a hard-core dieter and/or a bodybuilder. If you are still judging the food you eat as good or bad there are tow lies that you must know about. One you tell yourself and one you were told. Seeing these lies for what they are will bring you the mind space and peace of mind you deserve. So read on. Obsessive Compulsive Eating Disorder: Food Addiction vs “Normal” Eating. I had a very close friend who was a food addict—either obsessing on the next cool food or restaurant he would find or obsessing on how fat he was. He was not necessarily a binge eater, but he was a food addict. Food to him was much more than nourishment. I observed him convince himself that food was some sort of celebration, discovery, excitement, and even a source of pride whenever he found an unusual or brand-new food (like wasabi chocolate). I understood that food was much more important to him than to me. To me, food is nice; I like to have a dessert once in a while, and I still have a few very occasional cravings. But, overall, food is simply a way to take care of and nourish my body. Another difference between him and me is that he tends to put on weight, lose weight, and put on weight again, and I stay pretty much the same over time. I sometimes stop exercising; then I don’t like the way my belly looks so I go back to exercising. But I don’t exercise a lot. I basically exercise to take care of my body, because I like it to feel and look firm. He never exercises. He just restricts his diet from time to time. But, I have worked with several women who exercised up to five hours a day after a binge. If you want to break the yo-yo dieting cycle, forget the calories in and calories out myth. 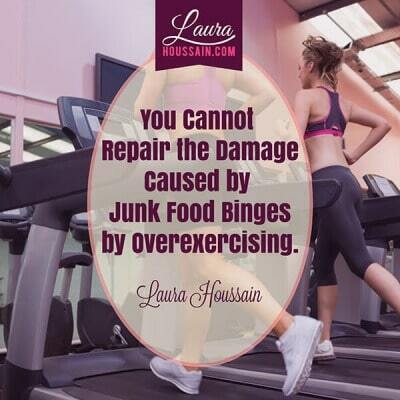 You cannot fix binge eating by starving yourself. 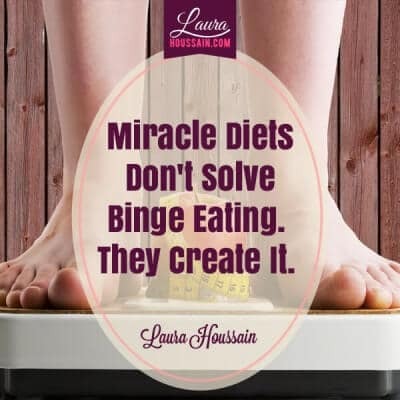 That’s because the starve-binge cycle changes the way you digest and absorb food. Your body is not a machine. It adapts to its environment to the way you feel. Food becomes an obsession when you have lost the pleasure of eating spontaneously; when it’s rules, rules, rules, stress, fear, and guilt… and, you abide by the rules because you are too afraid of what will happen to your body if you don’t. If that’s you, you probably have a strong motivation to do so. We will see why very shortly. I have accepted that I’ll never be on a permanently perfect diet. The only time I tried to restrict food, I failed my diet in three days and had my first binge. I quit dieting and never binged ever since. I do regulate my diet. For example, if I eat a burger one day, I won’t have any for a while—but I’ll not starve myself or I will not feel bad after eating it. And, I’ll have the bun, the sauce, and the fries too. I’ll enjoy it and move on with my life. I stay in the habit of eating at least 80% to 90% home-cooked nourishing foods. That’s my general guideline. I never feel deprived, and I’m happy to have a lemon tart or a piece of chocolate cake once in a while. They don’t make my day, and they’re not a big deal either. I think a lot of dietitians will agree that starving yourself after eating too much is totally counterproductive. It trains your body to retain extra weight in case you’re going to starve again later. Unfortunately, that common sense doesn’t make it to the media. I didn’t share the differences between a diet-binge mindset vs a “normal” eater mindset to make you feel bad. I’m sharing this because I want you to know that yes, you can be at peace with food. You can too enjoy food without guilt and not worry about the “food damage”every time you eat cake. It just requires you to think differently about food. Magazines, and now social media thrive on promoting the idea that “You should have a perfect body, or else.” The “else” is somewhat fuzzy but it always leaves you feeling not good enough. They publish pictures of never-aging perfect bodies that are heavily photoshopped on every page or posts. It signals your unconscious mind that perfect is the norm and that you should look like this. First of all, no one looks perfect, not even the models. Second, you really don’t need to look perfect to like yourself and become totally irresistible (Tweet this). The media has trained you to feel bad about your body’s “imperfections”. It has trained you to believe that when you look imperfect, you risk not being loved, valued, appreciated or wanted. But it’s just a lie. It’s a lie that costs you your peace of mind, and maybe your health, relationships, and joy. If you don’t believe me, here is an article about 6 hot female models who got dumped like the rest of us. The worst part is when it’s your parents, siblings or peers who sold you the “perfection lie” while you were growing up. If that’s what happened to you, you want to read my series on body shaming. Now, let’s look at how you’ve been deceiving yourself. Answer this question honestly. Have you ever told yourself while eating way too much, “Oh, I can fix this tomorrow,” or “I won’t eat tomorrow and that’ll be OK,” or “I’ll exercise for two hours and I’ll be fine”? If so, just stop giving yourself credit for something you’ll do in the future each time you eat compulsively. It’s just compulsive thinking talking you into a binge. It’s a Big Fat Lie because if you don’t eat normally you know you’ll have to pay for it at some point. The number one secret to staying thin forever is to eat satisfying, nourishing meals regularly (tweet this). This way, your body knows it will always have enough and stops storing fat. If you’re serious about staying thin for life, forget about counting calories forever. It makes your internal bargaining even worse. You know what is fattening and what is not. I trust you can make the choice between a corn dog and a fresh, home-cooked meal. Accept that no future miracle diet or pill will save you from your destructive, compulsive eating habit. What you eat builds the way you look. Start focusing on the choices you’re making in the moment. Bargaining with yourself gives you the illusion that you can control your food addiction in this manner. This is a Big Fat Lie. It’s OK to have some dessert once in a while, and you don’t ever have to pay for it later or bargain as long as you follow simple guidelines, like the 90/10 or 80/20 rule I mentioned earlier about eating home-cooked nourishing meals. You know that the more you repeat a behavior, the stronger it becomes. Giving yourself credit for something good you will do in the future only lets you become more addicted to food. It creates a self-destructive habit of denying what you’re doing and giving yourself credit for something you know you won’t do or that won’t fix the problem. Even if you fast later or exercise frantically, it will not make up for the amount of food you’ve eaten. It is denial in action. I hope you can understand that this kind of internal dialogue is actually one of the main reasons your addiction to food is so strong today. It’s a lie. A diet will not save your day later; just admit it once and for all. You have been lying to yourself long enough; you’ve been stealing yourself from happy, healthy, and balanced eating for years. Why don’t you just give up on the whole idea of dieting? Dieting is the illusion that you can inflate and deflate your body like a balloon at will. Your body cannot do that. (Tweet this) It’s much smarter than you think. It is designed to adapt. If you tell your body it will have too much food but will starve later, it will adapt by making you overweight. It will create more fat and absorb as much food as it can to prepare for days of starvation. You’re teaching your body to do that each time you binge and then starve or diet. Your body is your best friend, but you must make sure you understand each other. 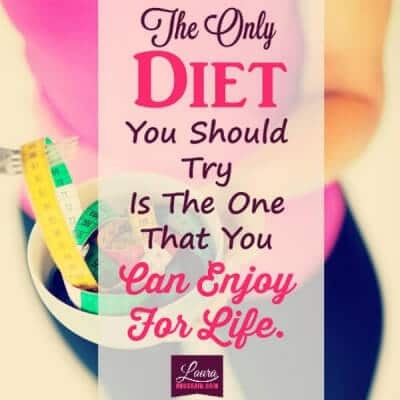 Choose a regular and balanced regimen and your body will learn new ways to handle food, ways that will help you keep a lean body without any diet. Are you sure you want to keep following the same food rules until you die? Restrictive diets don’t make food addiction or a compulsive overeating disorder go away. They make them worse. If you are serious about recovering from binge eating, the only diet you want to follow is one that you can easily sustain for life. Before you can do this you probably will have to stop believing the lie the media has been selling you. One way to get started is to notice how this lie has been controlling your food choices. To get started click here and grab your free cheat sheet on how to stop dieting and prevent binge eating. Also, each time you’re about to binge and tell yourself “it’s OK, I can diet later,” abort the thought and consider what experience has taught you. This is just one step to a bigger journey. But it’s one that helps. 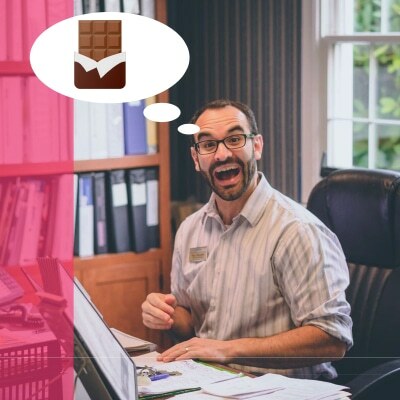 If you’d like to know how you too can find peace with food using the exact same program I have shared with my private clients, then join the Food Peace Switch VIP list to get notified when it’s available before anyone else. Make a decision that it is not OK to eat too many rich foods all the time or to binge on them. Decide to stop this habit each time you see it in action; abort that thought, “I’ll diet later and it will make everything OK.” Question that thought. Ask yourself, “Is that true? Is this what really happened in the past? How do I know that?” Question the thought until it has no real validity or truth to it. Contact me here, if you want to find out how I can help you set yourself free. I live in Paris, France so I won’t be able to meet you in the U.S.. This was incredibly helpful Laura! I love your brutal honesty, mainstream media contradictions and all of your tweet-ables! FANTASTIC!! Thank you April. I’m really happy to that it has helped you. Honesty is the best way out of compulsion. That’s what I believe. 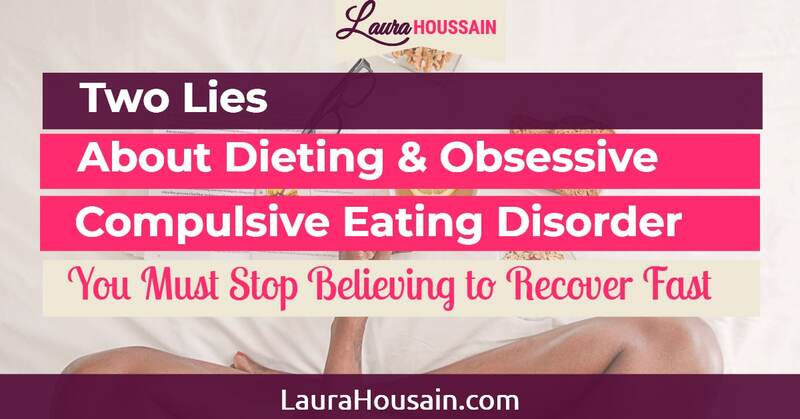 laura – i have worked with compulsive overeaters for years in my counseling/coaching practice, and your advice is spot on. i find that it is very difficult for them to make the transition into truly believing diets don’t work. intellectually they know it doesn’t make sense and has never actually worked for them personally. but they often still hope for the magic solution that will change their lives forever. Thank you so much April. I’m happy to hear from a fellow professional. I know what you mean. I usually ask them to give me 90 days and they usually completely change after three weeks. I do that by helping them accept themselves just the way they are. I teach them how to love themselves actively and all the sudden diets don’t matter so much and they matter first. When that happens, they have won. They just need to reinforce new habits and they’ve broken free. I just love watching them transform. Weight-loss is just the cherry on the cake, the cake is who they have become.